Vestrahorn Iceland is one of the most photographed mountains on the island. 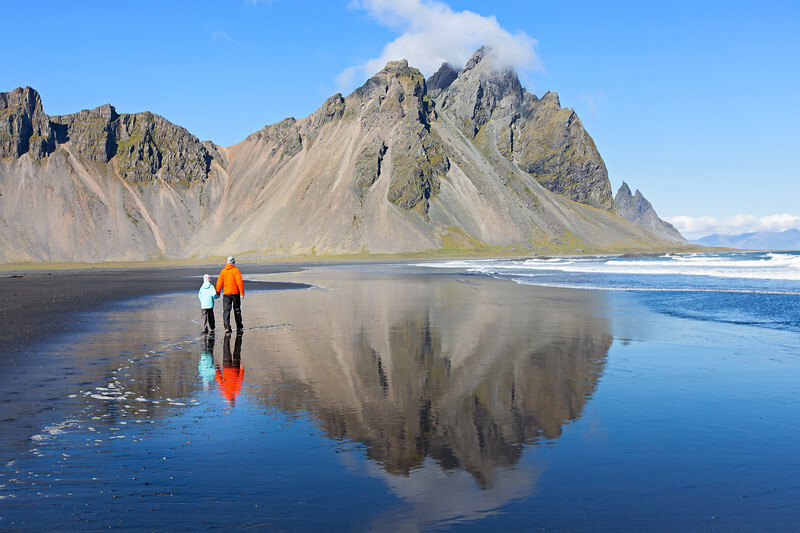 Located on the Stokksnes peninsula the whole area is magical with its steep slopes reaching a flat lagoon, a black sand beach and small black dunes. 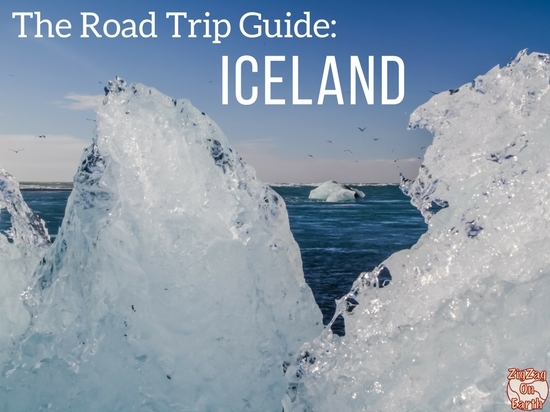 This natural wonder is one of the most beautiful Icelandic landscapes. Below is my guide to help you plan your visit to the Vestrahorn mountain Iceland. 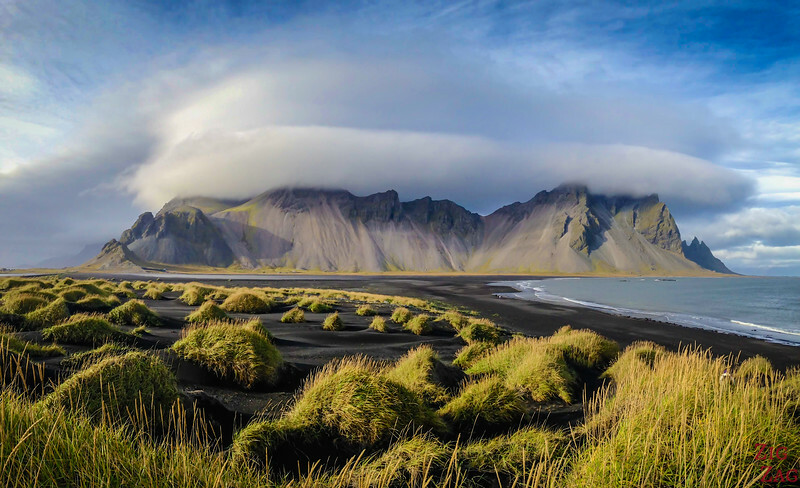 Vestrahorn, sometimes called Vesturhorn, is a dramatic spot where vertiginous cliffs meet a flat black sand beach. It is 454m (1490ft) high and sometimes called Batman Mountain. 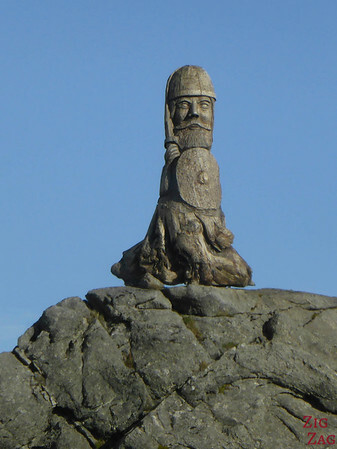 It is one of the highlights of South Iceland. Before you learn more about one of the best landscapes in Iceland, here is a photo to show you why it is so loved by Photographers and why you should add it to your Iceland road trip. How to get to Vestrahorn - On the Ring Road, drive East past the town of Höfn. After 7 km (4.3mi) turn right (south) onto an unmarked dirt road just before the tunnel. Vestrahorn Iceland Map - Where is Vestrahorn mountain? There is no ideal time or period to see Vestrahorn. When the clouds are high is better obviously, but the area is beautiful in all conditions. If you want to be able to photography it at sunset or sunrise, better to stay close to avoid too much driving. I recommend staying in or around the town of Höfn - check out the best customer rated accommodations in the area. Arriving at the fence of the military base, I turned around and discovered that amazing scene. I set up for a while away admiring this striking mountain and watching each cloud get stuck above it. Because I wan assure you it was windy and clouds were moving a lot, but on Vestrahorn, all were stuck. I waited quite a long time but the clouds never left. More were coming and pilling up at the top of the mountains. A bit frustrating but a wonderful spectacle! If you are not a photographer, know that I took the photos above with the Panorama option of the iPhone 3. Vestrahorn is a 454m (1490ft) high mountain. It is surrounded by Eystrahorn and Brunnhorn (the 3 little summits stretching into the sea like Batman). All of them together are often what we refer to as Vestrahorn, even if technically it is just one summit. All of them are made of gabbro and granophyre rocks (unstratified). Because of its shape and structure is is mostly scree on its side which makes it extremely difficult to climb. Since the second world war it is a military base and Natro radar station. If you walk to the end of the road you will see the fences. 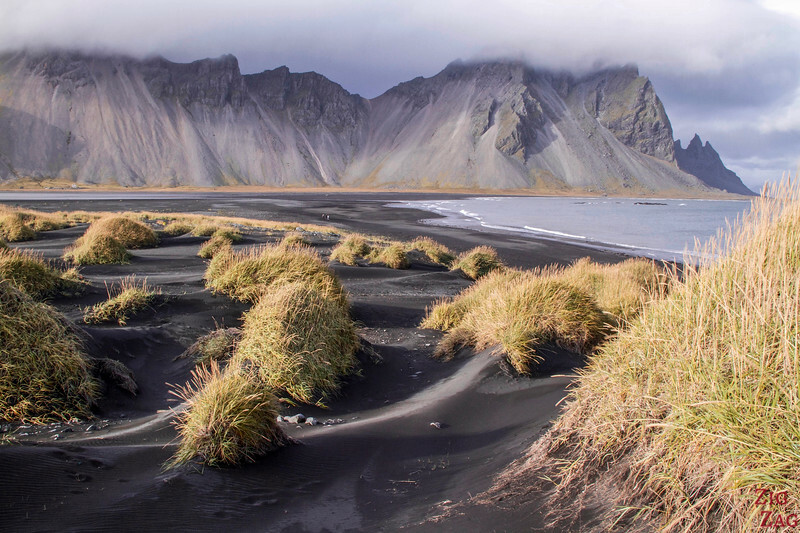 The beach just in front of Vestrahorn is made of black sand. And it gets crashing waves from the Atlantic ocean. With the volcanic activity in Iceland, the black sand and pebbles are tiny fragments from the basalt lava that covers the area. But the most famous pictures of Vesturhorn / Vestrarhorn are the ones with crazy reflections, and it can look like you are walking on water. 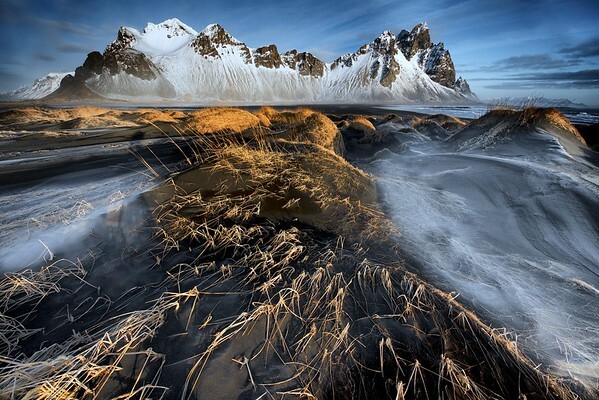 Like Kirkjufell, Vestrahorn is well photographed (although not as much as it is very isolated in comparison). I really recommend googling pictures of it and you will see that some are incredible with reflections and partial snow. Discover other options on my article about black sand beaches in Iceland. 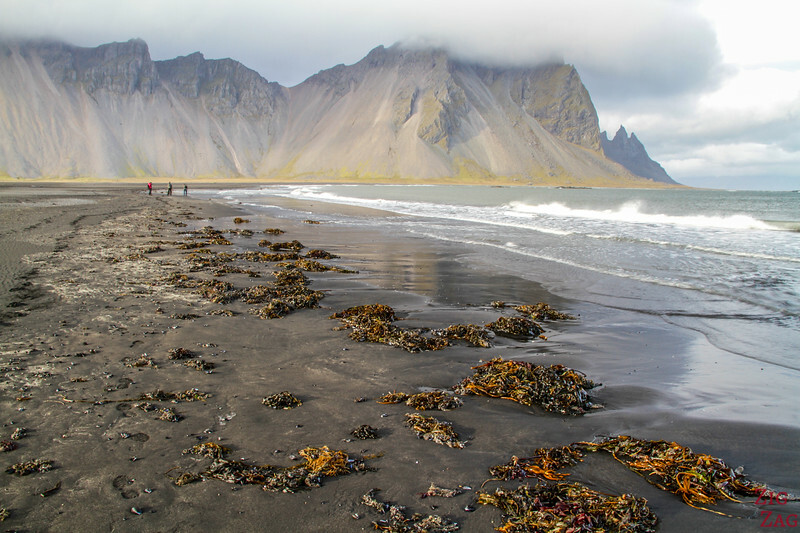 At this end of the Stokksnes beach there are small dunes formed by the black sand. It makes for a great foreground. They are not big but cover with some dense grass is some places. Just be careful not to walk on the grass and disturb the place, otherwise it will not be able to stand against erosion. If you look closely at the photo above some water remain on the sand and on quiet days (not windy) you can get wonderful reflections. Check out this example. With a good 4WD car, it is worth visiting Vestrahorn in Winter. Just be aware that the road will not be cleared, but it is not long and relatively flat. So the drive to Vestrahorn in Winter is not too difficult. Unpredictable weather is sometimes a good thing, don’t you think? I am trying to include this place in my plan. As I will be driving, it would be great if you could give me sine ideas on the road condition from Route 1 leading to the cafe. I am not a very skillful driver. Hi Carol. It is a gravel road that can be quite bumpy. Not technical, you should be fine (at least in spring/summer). Just drive slowly and check out the wind index that should be indicated on road 1. Thanks Claire. Your website is very helpful. I enjoy very much the research and pre-visit before my trip. Thanks Carol. So happy you find it helpful. Hi Claire! What a great blog! So helpful to prepare our trip in September. Just one question: how much is the fee to pay here in Vesturhorn? Thanks. Hi Lou. I am very happy you are finding it useful. It was the equivalent of a few US dollars, less than 5, but I do not remember exactly as our bus driver paid. Have a great trip! I am heading to Iceland mid sept and wondered whether it would be better (photographically speaking) to see these mountains at sunset or sunrise? As they are on the east end of Iceland, I would’ve thought sunrise, but can you get sunset photos here? For every place where you are wondering that, I recommend you use the Photographer’s Ephemeris (https://www.photoephemeris.com/) to see the exact setting point at your exact date. From what I am seeing, the orientation does not look ideal for the 15th of September. Hi Claire, I love your website! very resourceful and valuable. Thank you so much for all the info! I research a lot from it for my upcoming trip in August 2019. I’m still a little confused in regards to the time that we can spend there. From what I understood, we should drive to the cafe and then walk to the beach correct? How long is this walk?